Loft Resumes turns your vanilla-looking resume into a beautifully custom designed one that stands out from the crowd. Great idea for people that don’t have the design skills themselves. I’m not sure how I feel about this company using Lost Type Co-op fonts (my own included), which are pay-what-you-want, for a commercial service that they’re making money from. Cheers man, and all the best. Since our designs are so heavily based on typography, we wanted to make sure we used the most beautiful typefaces available. We trust the designer of that resume compensated you appropriately when he decided to use Haymaker. Also, we send our clients a PDF once their resume is designed and never transfer font files to them. Please email us if you have any more concerns over our use of your typeface. 1) We aren’t re-distributing the typeface. We actually send out an un-editable PDF to our customers. The designs are super fun and they’d surely catch my eye if I were an employer, though I think you’d have to carefully consider if they were appropriate for the job you were applying for. Another thing is that I know a lot of employers will print resumes (in addition to looking at the PDF; and not necessarily on color printers) and I wonder how that will factor in. Great resource for those in the right industries though and really glad to see a studio featuring the possibilities for resume design! Thanks for the responses, Emory and Dodd. I wasn’t trying to be divisive in any way — just wanted to make sure that everything was going on ethically, and you weren’t redistributing the font files. The designer didn’t compensate me, but as per the pay-what-you-want model, it’s not obligatory. Really? I would never hire anyone with such an over-designed resume. I’m enjoy a well-designed resume as much as anyone else, but these are really over the top. Simplicity is key, and these aren’t simple at all. There’s a lot of ornamentation that seems just for decoration; they look like the print version of what’s standard Dribbble fodder these days. All the sample photos show the resumes printed on beautiful textured paper, but if you’re just receiving a PDF they’ll most likely end up on standard letter copy paper. Furthermore, many of these designs have full-bleed designs which most people, even design students, won’t know how to print correctly (you’d be amazed at how many of my design school classmates didn’t know how to correctly set up bleeds on their print files, and this is from a predominately print program). This is especially true of HR people who are probably printing these en masse from the office laser printer. In the end, I think it’s a valiant idea, but the execution needs some work. Hi Matt. When we send out the final files, we include a full bleed version as well as a version that prints great on any office printer. That way folks have the choice as to which they would prefer to use. Even on standard letter paper or in a non-printed PDF, these do tend to stand out more than a standard black-and-white. We know these aren’t “traditional” and certainly aren’t for everybody but at the same time we’ve gotten great feedback from employers, job seekers, and career counselors who use and recommend the service. It’s not for everybody but certainly for some :) Thanks for your feedback! I think this is awesome. At the last company I worked for we called a girl in for an interview and the number one thing that stood out was that her resume was really interesting and creative like these. Of course it completely depends on the type of job you’re applying for and they’re not for everyone. I would definitely buy a resume at around this pricepoint if there were some designs that were a little simpler/ more traditional, for those of us who work in non-creative fields. I’m really glad to see someone doing this on a quasi-mass market scale. I’ve considered asking designer friends to make me a resume, but the cost and time involved in working with someone one on one never seemed completely justifiable. I recently hired 40 new employees and I would say that simplicity really is the key when it comes to CVs. HR are usually swamped with work anyway and everything that makes their life easier is a bonus point for the applicants. Personally I would find the decorative layout and style distracting me from the content and I am not entirely sure how they would like being processed by some of the HR software. If I was hiring a designer that’s a different story – I would expect the CV to be creative and reflective of the persons aesthetics. Overall I think it is an innovation that some people would approve of, whether it is welcomed by the HR departments I am not sure. I agree, it really depends on the field as to whether these CVs are appropriate… maybe a clue might be in terms of what you would expect the dress code to be at your place of work? Very conservative firms might balk at this type of design… also I work in academia, where a CV of this nature would be a serious no-no (and in any case, our CVs are usually 5+ pages long, not the standard 1-2 page in other fields). Here’s my reasoning: My resume is going to go into a stack of other ones which will follow all sorts of traditional formats, will include information that doesn’t even matter, etc – all in times new roman, 12pt or similar. I’m putting my name large, prominent, and in a non-standard font because I want to market myself as a sort of brand: it’s refined and professorial, but a little bit cheeky. It’s a representation of my personality on paper. If my resume is a stand-out, then my name sticks in the memory of whoever is hiring, and I’m that much more likely to get an interview. Stand out from the crowd they do. These resumes might get you a job, but not for the positon of a designer. I’d rather see clean neat type. If a designer can’t make a simple resume look good I would be a little worried about them. The rest of their portfolio will speak for itself. Our resumes help people who aren’t able to design one themselves. Myself being a designer, there are several designs we offer that I would gladly use for my resume. Great work. I love that people are criticizing you… that means you guys are doing good work. People that dont want a word document that gets lost will be greatly appreciative of your service. As VP of Sales for a software company if one of these came across my desk I would definitely give it a second look and dig deeper. Thanks for the great idea and I wish you both the best. I’m a designer…and I would never ever pay for something like this. 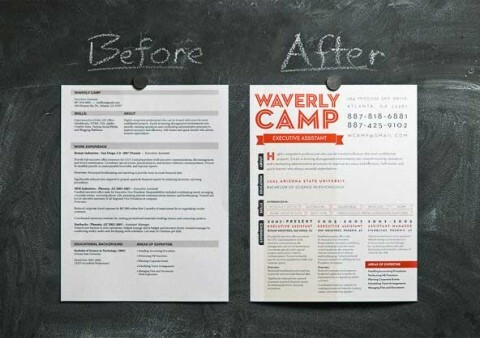 The first thing a prospective employer sees is your resume and if you’re applying for a design job, your resume should be a piece that you’ve designed. As for anyone in a non-creative field, I think if the hiring manager saw this as your resume, it would give a false sense of what you can accomplish. I’m pretty sure in most every job there is some degree of knowledge needed in a word processing program, and if your own resume is not something you created, especially with the more advanced features of Word, what good does that do? Our target market is not designers. I’m a designer myself and when we created the business, we knew designers were not who we were trying to help. But instead those people who appreciate good design and couldn’t create it themselves. I ordered express two day service, and did not receive my corrected resume until four days later. They only had to remove five words, and it took them two days. It did not make it to the interview. I would not recommend this service. Very attentive and accomadating. Job hunting is a very stressful and time consuming. I appreciate the great customer service. programmer vos envois à destination de tous vos prospects. notre système d’envoi est très fiable pour effectuer vos expeditions en masse. le top des systèmes pour l’envoi de SMS et de MMS. Il est possible de élaborer rapidement vos textes à destination de centaines de propects. I agree with those saying that a resume shouldn’t be over designed or “too busy”. However, I still prefer a modern resume over the old, boring, anonymous one. I personally got a resume template from http://www.trendyresumes.com for a few bucks and still very impressive. I contacted Loft a couple of months ago confident that they would be the right choice for my complex background, especially after I had looked at a number of other providers & services. I would rate their service as average. I was told that the Executive Level CV is best suited for my background, which is the most expensive option. Unfortunately I had to re-write and structure most of the cv myself. Although the person assigned to me did provide some help in putting my background together, yet the words chosen were rather technical, the phrases chosen unusual in particular for my creative field. The initial request I had was not met! Overall not a satisfying experience as I had hoped for. I provided constructive feedback without request of refund, although I still had to work on the CV myself to get it finished. The feedback was not even acknowledged much, more so actually thrown back at me, because it is my fault that I’m not happy with the outcome. For anyone seeking help with their cv I can not say that i would recommend Loft Resumes. para que llegado el día no tengamos que estar preocupándonos de nada. Loft Resumes – Yes, the designs are pretty, and that’s about it. When it comes to updating your resume, they are completely blase and unable to work within timeframes. I was specifically told that “I am a graphic artist,” – therefore I was left with a resume with spelling errors, and redundant categories. One of the reps, Nicole, apparently was overwhelmed with the amount of changes, and refused to do any more before I paid more. This was after of course, spending over 150$ with these people. Then they decided not to work with me anymore because I stated their behaviour had been unacceptable – and they said I was rude. So – can I be polite when the job was never done properly, and they refused to modify in a timely manner? I recommend just buy a template from Etsy, and modify it yourself. I don’t know why Emory wants anyone to email him to clarify my experience with his company. It was truthful. I eventually got a great resume with apologies. However, I did pay for express service, it wasn’t completed in the time frame. I don’t know why Emory wants anyone to email him to clarify his account of what happened. My comments where truthful. I eventually got a beautiful resume, with apologies, just not within the time for express service. Don’t buy anything from this website.